For 30 years, Tammy Waddell worked as a teacher in Forsyth, Georgia. She loved “her kids” and made sure that her students always had the opportunity to learn. It was something she deeply believed in. Earlier this month, she passed away after a battle with colon cancer. Two weeks before she died, she informed her son that she didn’t want flowers at her funeral. Instead, she wanted people to bring backpacks full of school supplies for needy students. Even on a day that was supposed to be about celebrating her life, she wanted to do something to help her students. Now a photo has emerged of her funeral service and gone viral across the internet. It’s clear from the photo above that Mrs Waddell made quite the impact on people in her community and the response was incredible. 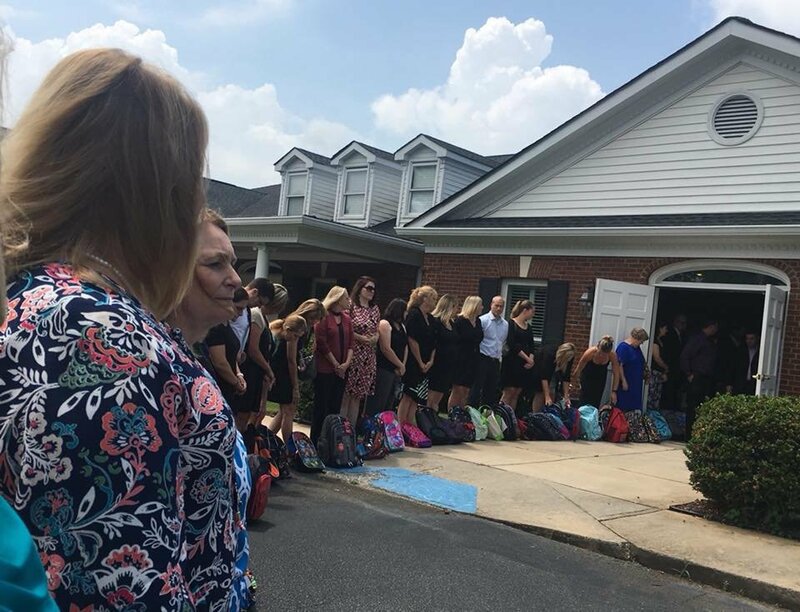 On the day of the funeral, about 130 backpacks filled with school supplies were brought to the funeral home. “This was just kind the kind of teacher she was, and this is a reflection of her heart. She was a teacher first, all the way,” her cousin Brad Johnson told reporters. The funeral service included more than just guest bringing backpacks for students in need. About 100 teachers who worked alongside Waddell over the years showed up to pay their respects. The teachers served as honorary pallbearers and brought the backpacks back to their respective schools. “That day we received roughly about 130 backpacks filled with school supplies — anything a student would need for at least half of the school year — and they continue to come in,” Paul Holbrook, a spokesman for the funeral home, told reporters afterwards. It’s clear that Mrs Waddell made quite the impact on both her students and colleagues. Even after her death, Mrs Waddell continued to serve her community and provide students with opportunities to learn and succeed. “She inspired in her teaching, and her final lesson has literally inspired the world,” Johnson concluded about his cousin. Since the photo of her funeral service has gone viral, Tes Resources, a non-profit organization that helps teachers around the world has decided to help out as well. The non-profit has decided to donate thousands of school supplies to Forsyth County students in honor of Tammy Waddell. This entry was posted in The Good Funeral on June 27th, 2018 by ObitTree .